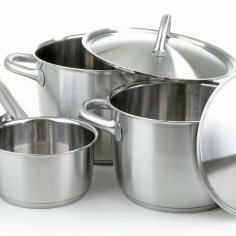 With their various shapes and sizes, pots and pans can be difficult to organize. 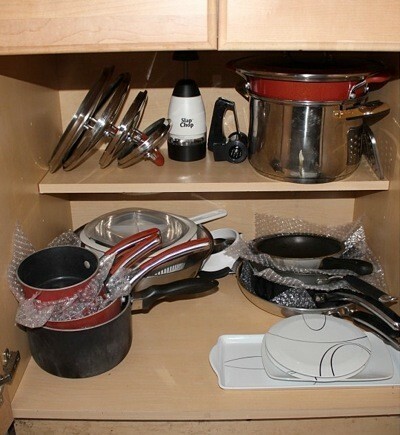 Getting your pots and pans organized will speed up cooking and keep your cabinets usable. This is a guide about organizing pots and pans. To keep my lids to my pans organized, I purchased a wire dish drainer and placed it in the cupboard beside my pans. I slide the lids in the slots the same you would do for plates and I no longer waste time and cause a lot of racket looking for the right lid. If some lids are too thick to fit into a slot you can remove the wire that holds the lids/plates into place to make it wider. I found an old ladder at an antique store for $5. I painted it and hung it from hooks on the ceiling in the kitchen. I purchased screw-in hooks and put them on the rungs of the ladder and on the outside to hang pots, pans, and other kitchen items. 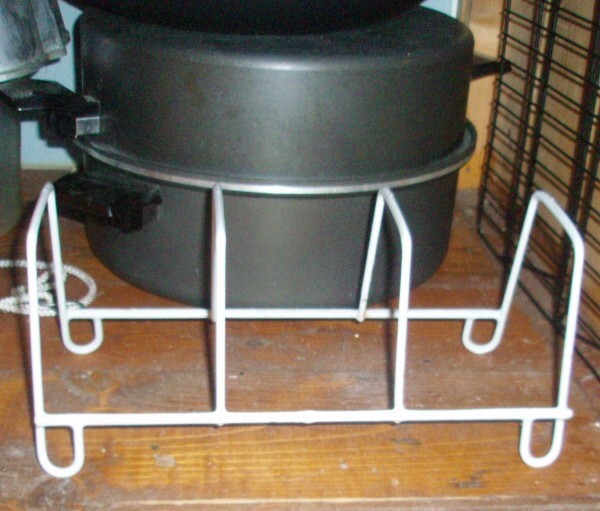 Very inexpensive pots and pans organizer with country charm. I hate looking for things in a crowded cupboard. I fought "lids" for years. One day, I put a drawer silverware holder in the cupboard and simply placed my griddles and lids sideways in the divisions and have had no problems with them sliding around since then. After years of struggling with my pot lids, trying to find the correct one, I used an old office file rack to organize them. It's great! They don't get lost in my cavernous cabinet and I always find the correct lid easily now. Plus it sure looks better than what I used to do! When trying to decide how to handle all the lids and bowls, pots and pans, always group by shapes. You will get more storage that way and a lot less hassle and mess. Would any of you happen to have some ideas on how to organize the pots and pans in my cabinets? The pots and pans just get thrown in the cabinet, where ever they can fit, and it is an absolute wreck down there! If anyone has some solutions or tips for my problem I'd really appreciate it! For extra storage space, store your cookie sheets and skillets in the oven. Just be sure to remove them before turning on the oven. Also, you can store microwaveable cookware inside the microwave. You never start the microwave without opening the door first! 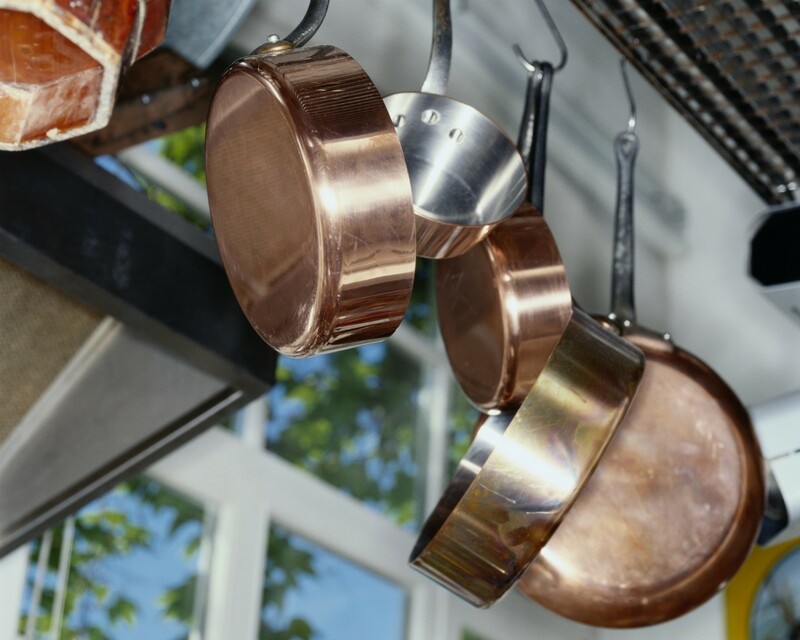 Pots and pans, (saucepans), can be hung from a metal rack suspended from the ceiling, (over the work top where you won't bump your head). I have one I got for $10 as the box was damaged - it is a black metal circular band enclosing thich black wire mesh - pans are attached with butchers hooks. This type of rack is handy for freeing up cupboard space but best for frequently used pots so they don't get dusty. The flatter type of baking sheet/cookie/muffin pans are best stored vertically - subdivide a shelf with vertical partitions to keep them upright. You can utilise the full height of the cupboard without having to take them all out to reach the bottom one as you would if they were stored horizontally one on top of the other. The other point that springs to mind is - have you got duplicates of pots and pans - how many do you need? Weed out the ones you rarely use and give them away. 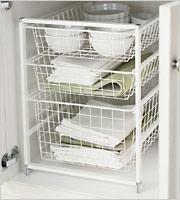 Use an inexpensive dish rack (the ones you would normally put dishes in to dry when you hand wash). They work great for fry pans, lids, etc. I turned my coat closet in my hallway into a pantry and use a shelf in there for my large pans and skillets, but not everyone can sacrifice a closet or may not have one. In the past I have left my cookware on the top of the stove with the matching lids on them. I also have space on the tops of my cabinets that is in the open and I use that for my large stock pots and roasting pan. IF you rent you may not be able to do this but I put cup hooks and small nails on the outside of my cabinets and hung my iron skillets on these. There are out of the way, yet ready to use when I need them. I also have a small kitchen and have had to learn to be creative. I have turned my skillets and griddle up on their side. I also keep my lids on their side. This has freed up room for my large pots and I fit as many inside of each other as possible. Help! Does anyone have any tips for organizing all of my pots and skillets that are in my kitchen? My kitchen is small, not much cabinet space but my cabinets are getting horribly messy! Thanks for the suggestions. A wire rack that's used for holding file folders upright can also be used for pot lids, cutting boards, cookie sheets, etc. My Mom has heavy-duty hooks screwed into the upper window casement of the window above her sink. So her skillets now hang in the window, out of the way, using previously unused space. This frees up a lot of space in her cabinets and the skillets are easy to get to when she needs them. I need help organizing my pots and pan lids. I bought a lid organizer from Target but some of the wires are too close together to fit the lids in. Do you have any suggestions? This site is very helpful. 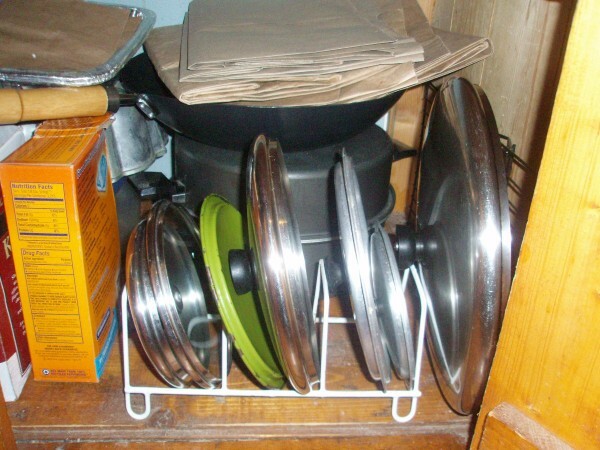 I've never use a lid organizer, but I will share what I do with the lids to all my pots and pans. My oven has a drawer on the bottom. It's not a broiler, it's just a storage drawer. All pot lids go in that drawer, that way I don't have to try to stack them with the pots or with each other. They're easy to find with minimal hassle. I do a similar thing for lids to plastic containers. Keep them in a cabinet drawer relatively close to the cabinet where I store the bottoms. I organize mine in an old dish drainer. I use an ordinary dish pan to store all my lids in after having the same problem. It has worked well for many years now. I use a standing pan file for my cookie sheets, muffin pans, and other flat things. and pull out to search. I keep mine in a two tiered file cabinet wire basket from the Container Store. Looks like a file cabinet but with wire sides. I have the largest drawers on the top and the bottom. All lids, including my 6 qt. pressure cooker, fit nicely in there. We've had this since approx. 1985 and it's still functioning well. It's placed inside a cabinet. I am by nature a very stingy (frugal if you will) person who would never spend a dime unless absolutely necessary. I keep lids, cookie sheets, a cutting board and a microwave bacon rack in an ancient dish drainer which is no longer needed for dishes. Silver racks from old dishwashers make good storage in the garage for small garden implements. Bubble wrap can be used to protect pots and pan from scratching each other while stored. This is a guide about use bubble wrap to protect stacked pots. This is a guide about hanging pots and pans. One way to better utilize space in a kitchen with limited or unsatisfactory cabinet space is to hang your pots and pans.